Obviously any manicure starts off with a nail file and I really like those 4-phase files with which you can't only shorten your nails, but also even, buff and polish them. 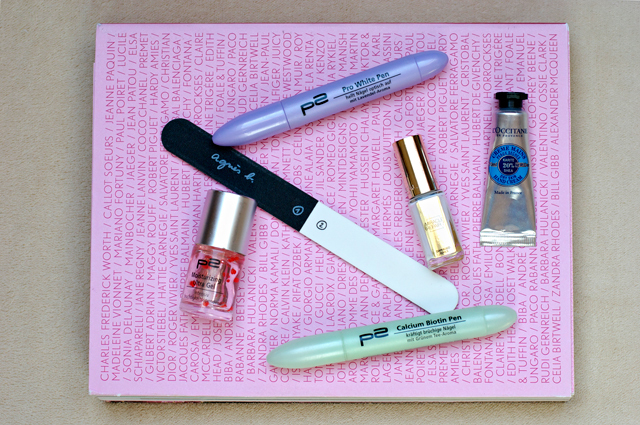 Currently I'm using and loving this file by agnès b. but you can also find good ones from Wilkinson or at Sephora. The only thing you have to take care of, is not to buff your nails too much as they will become thinner and more likely to break. Two times a month is the max for a whole 4-phase treatment. The next step in my nail care routine is this moisturising gel which I have reviewed before. It comes with a brush and needs to be rubbed in. What I like about it, is that it works in a really gentle way and doesn't smell of nasty chemicals. The calcium pen is great for brittle nails and again works really gently. I love how easy it is to apply and that you can just take it with you and do your nails some good from time to time. The Pro White Pen on the other hand is great when you want to give you nails a nail polish break as it lightens them up naturally and leaves them with a nice purple glow. Plus it heavenly smells of lavender. I can't even count the times I've praised this product but it really is too good to hide from you. Since I've been using it as a base coat my problems with brittle nails have diminished and I also love it to use alone, as it gives my nails a healthy white finish and reminds me of some of these lighter Essie shades like for example "Marshmallow". Head this way for more about the Miracle Repair 7. The last step of a manicure should always be some hand cream, which doesn't only work for your skin, but also for your cuticles and nails. At the moment I'm using the L'Occitane Shea Butter but I can also recommend Le Petit Marseillais or Greenland hand creams. Thanks for sharing your manicure tips! I also use L'Occitane's hand cream at the moment.